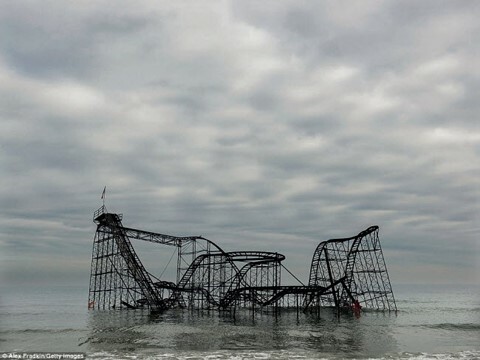 Around the world there are big projects for some reason abandoned in history for a long time. 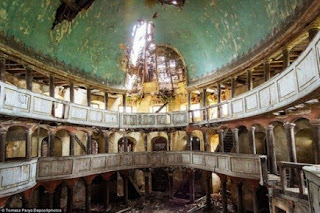 Let's walk through these impressive places and learn about their history. 1. After the mining industry in Bolivia collapsed, railway lines serving this sector fall into the abandoned state. 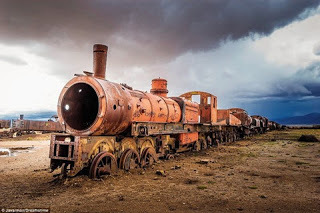 But today, many people have returned to Uyuni train cemetery to watch the rusted trains. 2. Before Sandy hurricane in 2012, Jet Star roller coaster system in Seaside Heights in New Jersey (USA) is an attractive sights. Unfortunately, the storm made structures submerged in seawater and loss. 3. 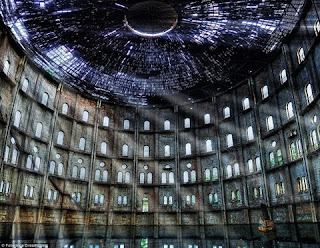 Located in the city of Warsaw in Poland, this large building used to be a gas plant Wola began operation in 1888. The factory closed in the 1970s after the city stopped using natural gas. Today, a part of this project is used as a museum, while the rest are still abandoned. 4. 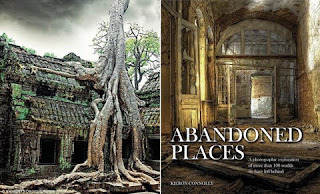 An ancient trees growing on the Ta Prohm temple in Angkor Wat, Siem Reap, Cambodia (left). Scary destination lies in a new book entitled "abandoned Places", the author Kieron Connolly (right). 5. 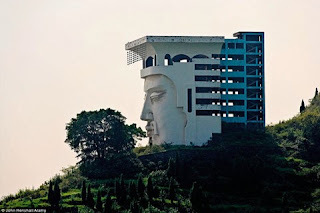 This odd-shaped hotel is located near the "ghosts" city Fengdu, on the banks of the Yangtze River, China. This work has not been completed and is in a state abandoned. 6. Above is a disrepair frame in a Protestant church, in the village Zeliszow (Poland). Church roof with a large hole, while peeling paint and wood fragments scattered all over the floor. 7. 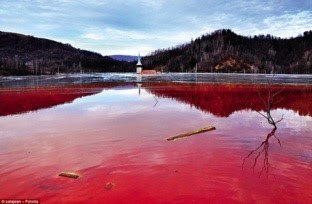 The lake’s water is in red cyanide color due to pollution and other chemicals; this lake has been used to submerge a villages in Romania, Geamana, to serve a nearby copper mine. Everything you can see is the tip of the church on the lake surface. 8. 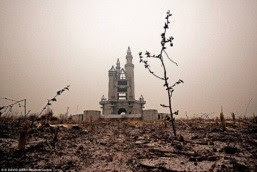 This unfinished castle lay neglected in Wonderland theme park on the outskirts of Beijing, China. This project is aborted after investors and people do not reach agreement on compensation for land. 9. 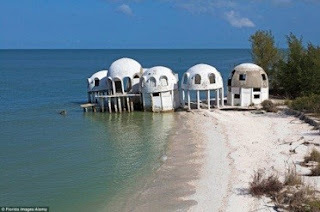 Built in the early 1980s in the city of Cape Romano, Florida (US), the houses use solar energy to serve people for about 10 years. But in 1992, Andrew hurricane caused heavy damage to the area and the house continues to be ravaged by Wilma hurricane in 2005. 10. 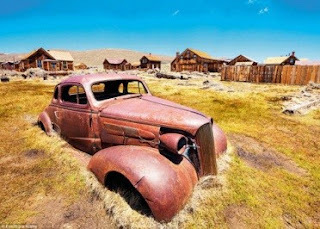 When gold was discovered in the town of Bodie, California (USA), in 1859, it became a bustling town, but then they faded away by the new gold rush. Today, Bodie still remain in ruins and became an attractive tourist destination.